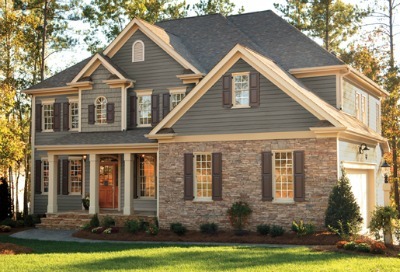 CertainTeed Shake Vinyl Siding is an exceptional choice to express your love of the rustic, natural beauty. All the rugged charm of cedar without the high cost and high maintenance. 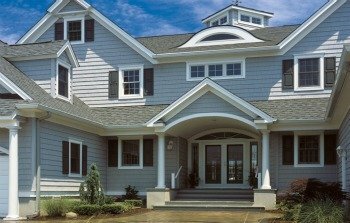 Makes an absolute stand-out as a whole-house siding or use to add an distinctive accent to a part of your house. Shake has the rustic look of freshly sawn natural cedar siding without the high cost and maintenance of real wood. A great way for you to express your love for the rustic outdoor natural beauty and charm of cedar, an absolute stand-out as as whole-house siding or as a distinctive accent to your existing home. Cedar Shakes are used here as an accent along with stone. Truly a classic look. Cedar Shake comes in two basic styles, Straight Edge and Staggered Edge. Note how the bottom edges are straight. CertainTeed Impressions Straight Edge Perfection Cedar Shake Vinyl Siding. Note the bottom edges are straight across, hence the name 'straight edge'. Deep shadow line between individual shingles and straight edge design that is commanding in its simplicity, and perfectly suited on a modern estate or small town single family home. CertainTeed Impressions Staggered-Edge Perfection Shingles. Note the bottom edges are staggered, hence 'staggered edge'. The staggered pattern creates an impression of cedar shingles that have been hand sawn and individually applied. 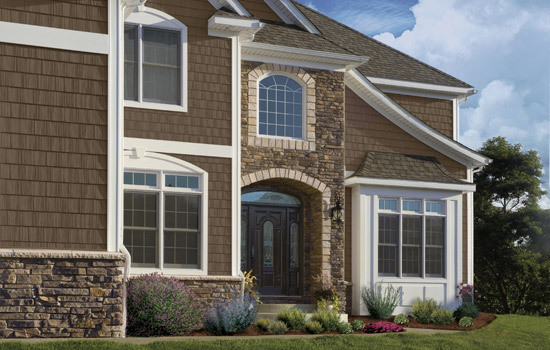 Cedar vinyl siding adds a warn natural look to any home. These shingles come in .100 mm or 1" thick injection molded polymer panels that look exactly like real wood. Designed and tested to withstand hurricane force winds. Ideal for areas where harsh weather may be a concern. 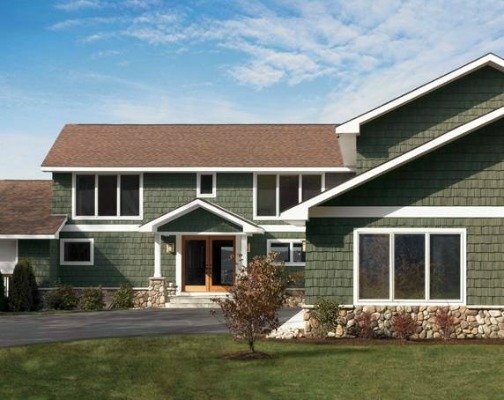 Great examples of shake vinyl siding used along with cedar shakes. The cedar board used on main house with shakes used on top gable. Cedar shake vinyl siding used here along with natural stone to create a very rustic and distinctive look. 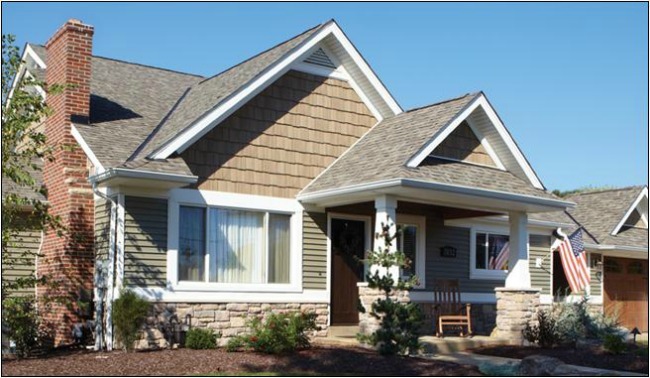 To see more pictures of homes using Cedar Shake vinyl siding click here. 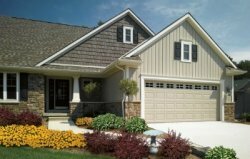 Click here to see Certainteed Cedar Board Siding Brochure, and review different types, styles and colors. Cedar shake half-rounds are used as trim or accent areas around your home. They look like half round cedar shingles. Half-Round Shingles are used to add that special accent touch. Adds a distinctive look on any house. 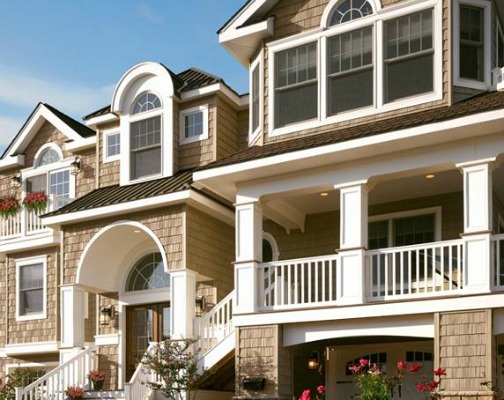 Along with half-rounds, cedar shake vinyl siding comes in a wide variety of different profiles. To see some pictures of homeowners using this type of siding click here. CertainTeed Cedar Impression Double 7" Perfection Shingles in Natural Clay Color used on upper gables of the house. White Cedar Impressions 6-1/4" Half-Round shingles used as trim between the bottom clapboard and the top cedar shingles used on the gables. Monogram Double 4" Clapboard used on bottom of house. Three different types of cedar siding all used together to create a special look. CertainTeed Cedar Impressions Straight Edge Perfection Shingles, double 7" in Sterling Gray color. Shown here is CertainTeed Impressions Cedar Rough Split Shakes, double 9", in Sable Brown color. Used as accent siding on the house gable while CertainTeed Board & Batten 8" Vertical Siding is used on the garage gable. 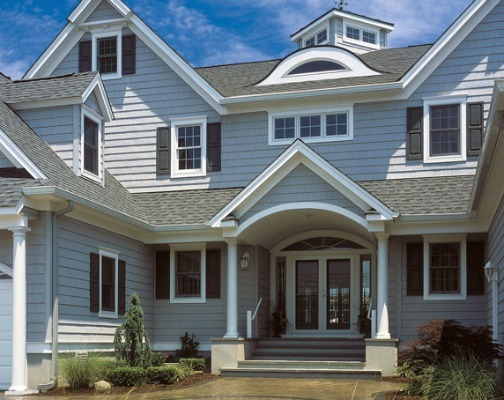 Cedar shake vinyl siding is outstanding for cold harsh winter winds. 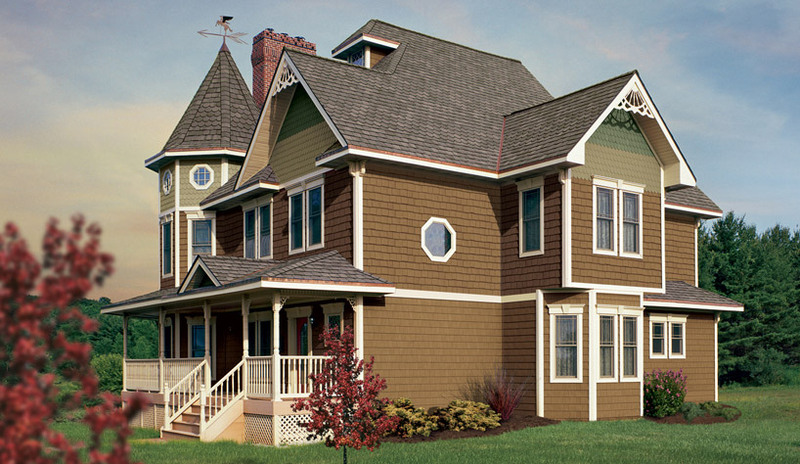 All the rugged charm of cedar shake siding but without the high cost and high maintenance. 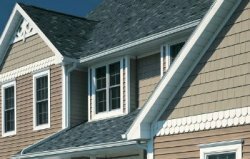 Back to the Vinyl Cedar Shake Siding page click here.